It’s generally assumed that Dads are less picky when it comes to gifts on Father’s Day, which is why there is less of a fuss made about them on their special day than Moms. Well, maybe it’s just the way men are wired! It’s also considered that Dads appreciate gifts that have a more utilitarian value compared to something that’s just pretty. 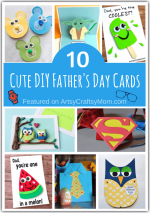 So since it is, after all, a day dedicated to fathers, let’s go with what Dads really want and check out some super-useful gifts for Father’s Day that even little kids can make! Even the most technology-loving Dad will have at least a few papers lying around, so this pour painted paper weight from Happy Hooligans will come in handy to help them stay put! It’s amazing how plain beach rocks can turn into something so gorgeous! Does Dad have an inner geek? Then he’ll be over the moon with these stylish yet fun comic book magnets from Crafts by Amanda. You need some specialized supplies so you may have to order them beforehand. Just be sure that the old comic books you use for this craft aren’t among Dad’s favorite vintage ones! Dads usually have lots of keys, so help him keep them organized with this adorable wooden key chain from Easy Peasy and Fun! They’re really easy to make, and you only need to worry about sourcing some wooden blocks and sandpapering off the rough edges. Is Dad a die-hard sports fan? In that case, it’s quite likely that he has a favorite team too, and he’ll be beyond delighted when he gets these shot glasses in his favorite team’s colors! 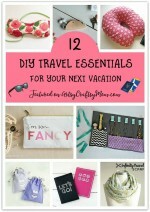 They’re really easy to make; get the tutorial at Moms and Crafters. Any Dad will love this handprint T-shirt made of his kids’ little handprints! A perfect craft for toddlers and preschoolers, all it involves is putting paint on palms and stamping away to glory till the entire T-shirt is covered! For more suggestions, check out the Michaels blog. If the Dad in your home enjoys spending time in his tool garage, then he’ll love this clever Nuts and Bolts photo frame from One Time Through! What’s more, there’s an accompanying art print, so he can set it up on his desk and be reminded of how much his kids love him! You might think the Star Wars fanfare has died down, but to a true-blue Star Wars fan, it never will! Give Dad a fun Star Wars print mug from Made in a Day, where you’ll also get free printables to get the pattern just right! Trace, outline and color in with sharpies for a one of a kind mug! 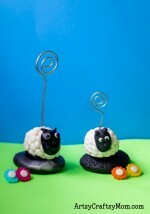 If Dad’s an avid golfer, why not make something that’ll add some color to an average golfing day? These decorated golf balls form Laughing Kids Learn are perfect for toddlers and will make Dad smile every time he goes golfing! Speaking of golf, if Dad has several golf balls, it’s likely he also has many golf tees, which need organization. And who better for the job than this adorable little golf tee porcupine from Reading Confetti? This is a slightly messy craft, so be sure to have lots of newspaper! This Dad Tray from That Artist Woman is a lovely, customized gift that Dad will love to keep forever! Turn simple terracotta plant pot trays into a catch-all for Dad’s everyday stuff. 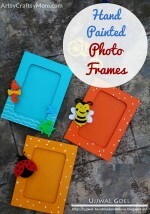 This is also a great way to preserve kids’ artwork, and you can decorate it any way you like! We’ve already mentioned a gift idea for the comic book Dad, but what if he has a favorite superhero? Why, you’ll make a gift based on that, like this superhero coaster set from Messy Little Monster! Kids’ handprints turn into cute (though angry) looking superheroes and there’s even a fun ‘Dad you’re my superhero’ gift tag to download! This is one for the older kids, since it requires some time and effort – but it’s completely worth it! Use felt, fabric and ribbon to make this shirt-themed pen holder from Chica Circle, complete with buttons! Perfect for the Dad who likes to dress well! We’re sure we’ve got at least one gift suggestion for every kid in your home, whatever his or her age may be! 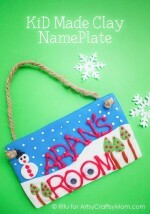 You can also combine a few and make a fun set, like the golf crafts or the comic book crafts. 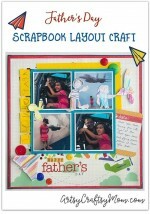 After all, a craft that involves the whole family is the best gift that Dad could get!